Located on 3/4 acre in subdivision with pool, this home has a beautiful view of the Three Sisters from the living room. 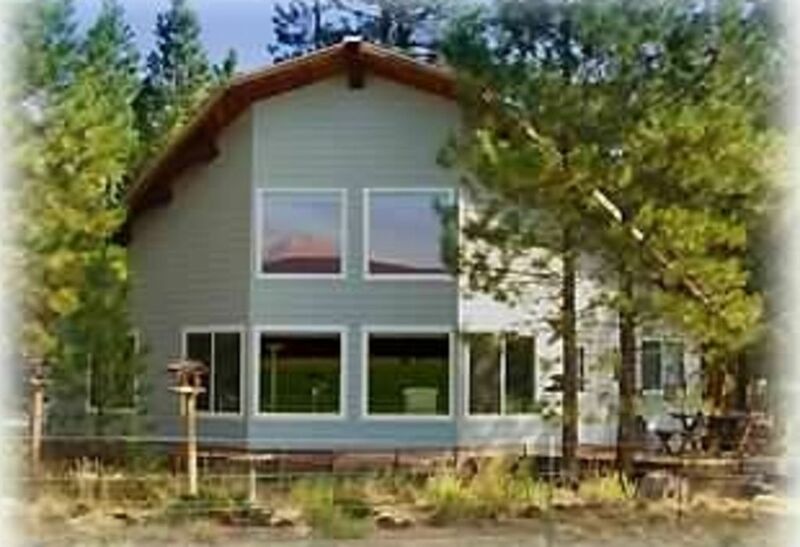 25' vaulted ceilings with pine walls open up to a wonderful pasture with wildlife galore! Pets Allowed, No Smoking. Woodstove adds to comfort with all the amenities of home!! Master bedroom has a queen bed, second bedroom has a queen bed and day bed. Lots of decks for outdoor dining and watching the deer, bluebirds, squirrels, cattle, etc. We loved staying in the cabin. Everything was clean and cozy with all amenities. Thank you! Clean and as described. The mountain view was awesome. Would return! Great cabin to work as a base for outdoor activities. Quiet neighborhood, views of mountains (Sisters) from the living room and deck. Everything (appliances, heating, internet, TV etc) worked well for us. Finishes and furnishings are a bit dated but everything was clean and well suited to a rental. Would definitely rent here again on a future visit. Great place to kick back and relax. Lots of movies and books and wonderful view. Did not get a chance to use BBQ, but sat out on the deck with coffee in the morning and wine in the evening just looking at the mountains. We will be back! The neighborhood was extremely quiet, the view from the back porch is incredible. Summer rates June 1 2016 to Sept 30 2016 are $140/night weekly $840 rates are subject to change until reservation is made. Christmas and New Years and Thanksgiving at summer rates.